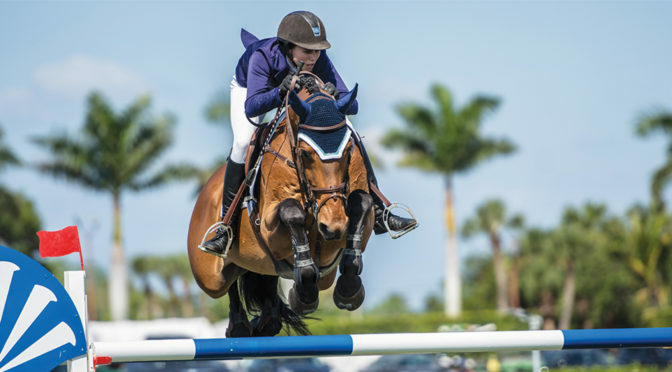 World-class equestrian sport has returned to the Palm Beach International Equestrian Center for the 12-week Winter Equestrian Festival, which opened on Jan. 9 and continues until March 31. With more than 70 divisions of hunter-jumper competition featuring everything from short-stirrup up to Olympic-level show jumping, WEF is the premier winter equestrian destination for many of the world’s best horses and riders. Managed by Equestrian Sport Productions, WEF is the largest and longest-running equestrian festival in the world, with more than 8,000 horses competing throughout the winter circuit and welcoming competitors of all ages to the venue to enjoy the temperate South Florida winter weather. The Palm Beach International Equestrian Center has long been recognized as one of the finest equestrian venues in the world. Each winter, riders from 42 countries and all 50 states travel to Wellington to compete at PBIEC. The venue covers 500 acres of pristine landscape, with 80 acres of competition rings alone. The four CSI 5* Grand Prix classes, the highest designation of international show jumping in the sport, will take place on Feb. 9 (WEF 5), Feb. 23 (WEF 7), March 9 (WEF 9) and March 30 (WEF 12) in the International Ring at PBIEC. These competitions feature the top horse and rider combinations in the world and include four FEI World Ranking classes during each week. The final CSI 5* competition of the circuit (WEF 12) hosts the $500,000 Rolex Grand Prix CSI 5*, the most prestigious international class of the 2019 season. This year, the $500,000 Rolex Grand Prix CSI 5* will once again take place on the final Saturday of the season. The $75,000 Battle of the Sexes, presented by Wellington Regional Medical Center kicked off the Saturday Night Lights series on Saturday, Jan. 12, pitting males against females in a battle to see which gender will come out on top. Always a crowd favorite, spectators were encouraged to support their favorite team by wearing either blue or pink. WEF welcomes Equinimity LLC as a second-year title sponsor of the popular WEF Challenge Cup classes, Thursday’s weekly highlight competition. The Equinimity WEF Challenge classes began Thursday, Jan. 10 and continue through Thursday, March 28, with distributed prize money ranging from $35,000 up to $132,000. The CaptiveOne Advisors 1.50m Championship Jumper Classic classes are once again set to take place throughout the circuit at both PBIEC, Equestrian Village and on the Derby Field, culminating with a final class under the lights on Saturday, March 23 with the $132,000 CaptiveOne Advisors 1.50m Championship Classic Final, which takes place under the lights in the International Ring and offers a substantial prize for the overall series winner. The season will also see a return of the prestigious Hermès Under 25 Grand Prix Series, showcasing the next generation of talent for five editions of competition. Hosted at both the main grounds of PBIEC and at Equestrian Village, the Hermès Under 25 Grand Prix Series is sure to impress, once again featuring many of the world’s top riders under the age of 25. The Great Charity Challenge, presented by Fidelity Investments, a major philanthropic event hosted annually at PBIEC, is set for the evening of Saturday, Feb. 3. The GCC has raised more than $12.2 million for more than 250 Palm Beach County charities. The GCC is a pro-am style relay race between teams of riders in costume. This year’s theme is “We Are The World,” and teams will have the opportunity to represent countries and nations, along with their traditional customs in costumes and decorations. The winning team will claim more than $150,000 for their paired charity, while all participating charities receive at least $15,000. A continual crowd favorite, the $150,000 Nations Cup CSIO 4*, featuring team format competition between riders representing their home countries, will be part of Saturday Night Lights in 2019 and will be hosted on Saturday evening March 2 during WEF 8. In 2018, Great Britain claimed top honors with a relatively young team featuring Amanda Derbyshire, Emily Moffitt, Ben Maher and Emily Mason, who will look to defend their title once again this year. Spectators are encouraged to represent their favorite team and country, as prizes are given to the “most spirited spectator” throughout the evening. Grab your flags and bring the family! The $100,000 USHJA/WCHR Peter Wetherill Hunter Spectacular during WEF 6 draws eyes to an evening of beautiful hunter display, as riders competing for one of the discipline’s yearly top honors take to the International Ring for an evening of traditional and classic hunter competition. WEF 6 also features a varying group of hunter divisions competing in the International Ring throughout the week, while FEI CSI 3* jumper classes will take place at Equestrian Village. WEF concludes on Sunday, March 31, with the $50,000 USHJA International Hunter Derby on the Derby Field to officially end the 12 weeks of the season. Top hunter riders will set out on the beautiful course in an attempt to capture the final major prize of the winter circuit. Spectators are encouraged to enjoy the final day of WEF from the berm on the Derby Field or on the adjacent grassy hill. General admission is free to the public at the Palm Beach International Equestrian Center during the WEF circuit, which hosts competitions from Wednesday mornings through Sunday afternoons. Numerous vendors and shops are open throughout the circuit, showcasing items and products ranging from horse wear and tack to art, jewelry, fine clothing and emerging technologies. The Saturday Night Lights competitions serve as the highlight class of the week for top international show jumpers and the most popular for spectators. They take place on each Saturday of the season beginning at 7 p.m. Family-friendly entertainment is offered throughout the evening, including live music, face painting, carousel rides, children’s activities and more. The Palm Beach International Equestrian Center is located at 3400 Equestrian Club Drive in Wellington. For more information about PBIEC or WEF, visit www.pbiec.com or call (561) 793-5867.